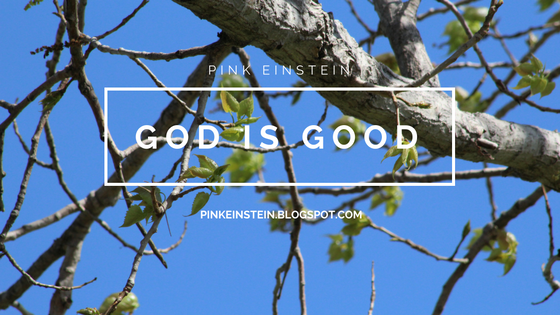 Life as Pink Einstein | Dallas Fashion and Lifestyle Blogger: God is Good! If we're being honest here I should really be doing my English homework that's due tomorrow but it's kinda stressing me out and I would much rather blog and listen to Christmas music than do homework. Today I am talking about God. God is someone I don't talk about nearly enough on my blog and I realize that and I am trying to fix that. Today we had a really great message at church and I wanted to share it with you. I am going to be giving you three reasons why God is good. Yes, I know there are millions of other reasons why God is good but here are just a few. God gives us gifts we don't deserve. Ephesians 2: 4-5 "But God is so rich in mercy, and He loved us so much, that even though we are dead because of our sins, He gave us life when He raised Christ from the dead. (It is only by God's grace that you have been saved!)" You did not deserve the gift of eternal life at all but by God's grace we can live forever with Him! God has unconditional love. Ephesians 3: 17-19 " Then Christ will make His home in your hearts as you trust in Him. Your roots will grow down into God's love and keep you strong. And may you have the power to understand, as all God's people should, how wide, how long, how high, and how deep His love is. May you experience the love of Christ, though it is too great to understand fully. Then you will be made complete with all the fullness of life and power that comes from God." Think about your parents. They love you no matter what you do but God's unconditional love is bigger than all of the parents in the world! He loves you no matter what you do and He loves you more than anyone on earth ever could! God is good because of eternal life. Colossians 1: 9-12 "So we have not stopped praying for you since we first heard about you. We ask God to give you complete knowledge of His will and to give you spiritual wisdom and understanding. Then the way you live will always honor and please the Lord, and your lives will produce every kind of good fruit. All the while, you will grow as you learn to know God better and better. We also pray that you will be strengthened with all His glorious power so you will have all the endurance and patience you need. May you be filled with joy, always thanking the Father. He has enabled you to share in inheritance that belongs to his people, who live in the light." Be gracious that we get to live forever! Tying into the first bullet point He didn't have to give us eternal life but guess what, He did! As long as you believe in Him you get inheritance because God is good.